A joint venture between BAM Nuttall and Mott MacDonald has been awarded a £23 million contract for a major flood defence scheme in Hull. They will carry out vital work to design and build new defences at a number of locations along the River Hull, as well as upgrading the existing defences. The work will help ensure the existing river defences continue to reduce the risk of flooding in the city, which suffered severe flooding in 2007 after prolonged rainfall. Located within a 7.5km stretch, 39 hard defences will be repaired by BAM after extensive surveys showed some of the defences are now in need of repair or replacement. 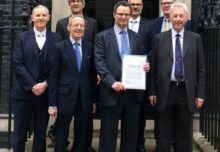 As part of a £36.5 million scheme by the Environment Agency, BAM Nuttall Mott MacDonald Joint Venture (BMMJV) will protect around 45,000 properties in Hull from flooding. BMMJV was appointed to the project through the Environment Agency’s Water and Environment Management (WEM) Framework under a two stage tendering process. New defences will utilise combi sheet pile wall, undertaken using marine plant, while concrete will be used to restore existing defences. Work is planned to begin in spring 2017, with planned completion scheduled for autumn 2019.